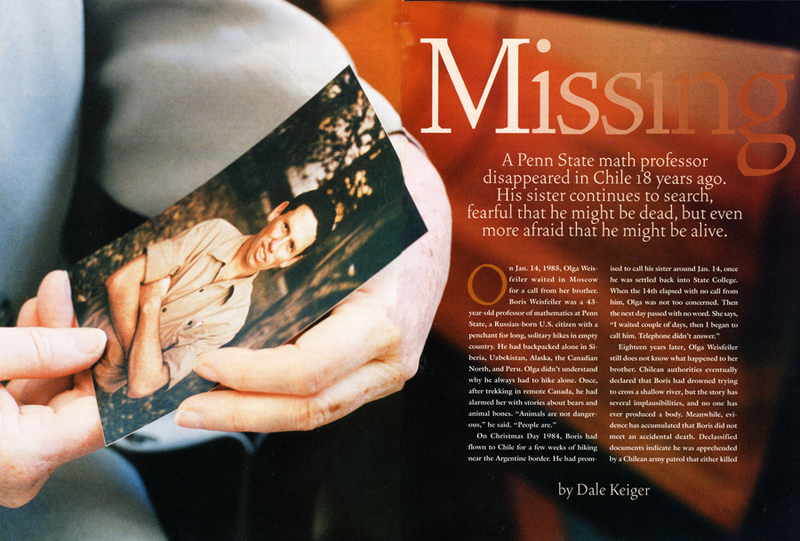 It’s hard to believe it’s been 25 years since Penn State math professor Boris Weisfeiler disappeared. Weisfeiler left University Park to go hiking in Chile over the holiday break in December 1984—and he never came back. This was during the era when Chile was led by the dictator Augusto Pinochet, and many people believe that Weisfeiler fell victim to Pinochet’s security forces—the only American among the nearly 1,200 desaparecidos from the Pinochet regime. Seven years ago, we wrote about Weisfeiler’s plight and about his sister Olga’s tireless efforts to find out what happened to him. Our story (see image above) was written by Dale Keiger, who is associate editor of the Johns Hopkins University magazine and who has done a number of articles for us as a freelancer. Another site worth checking out is this one from the Chile Documentation Project at the National Security Archive; the director of that project, Peter Kornbluh, has been involved in efforts to get some answers about Professor Weisfeiler. There’s also a Weisfeiler family Web site devoted exclusively to Boris’s case. Entry filed under: The Penn Stater Magazine. Tags: Augusto Pinochet, Boris Weisfeiler, Chile, Chile Documentation Project, Dale Keiger, desaparecidos, Mother Jones, Olga Weisfeiler, Penn State math professor disappeared, Penn State mathematics department, Peter Kornbluh.